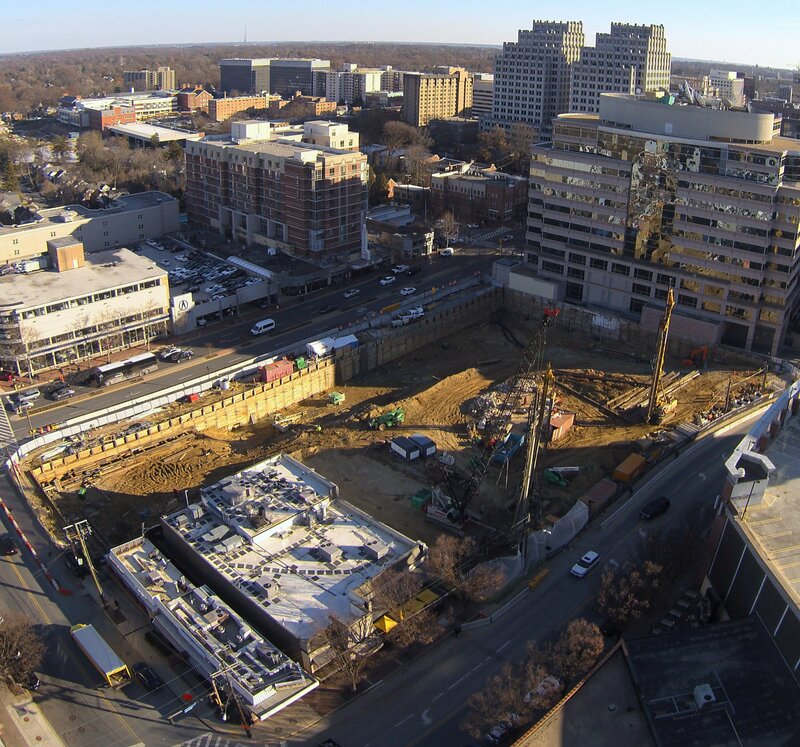 Pepco will soon complete the undergrounding of the surrounding overhead power lines, paving the way for the completion of pile installation. We anticipate approximately one more week of pile installation and associated noise. Once this process is completed, the pile rigs will be removed from the site and heavy excavation equipment will move in. The excavation will continue with much less noise, however, an increase of dump truck activity is anticipated as they enter and exit the site along Woodmont Avenue. Beginning in January, the next phase of excavation is anticipated to begin, including blasting of the development site’s bedrock. This work will only be performed during daytime hours. 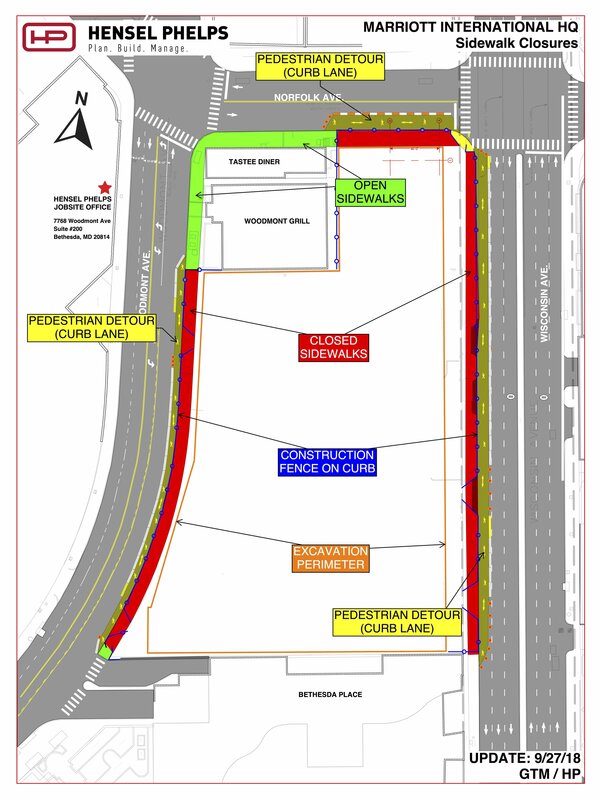 In an effort to mitigate noise for nearby residential properties, as well as traffic congestion along Woodmont Avenue, trucks will continue staging along Wisconsin Avenue within the barrier lane beginning at 6 a.m. and clearing the area by 10 a.m. During this time, the sidewalk along the west side of Wisconsin Avenue will be closed to pedestrians. Please pay special attention to signage and take advantage of nearby crosswalks as needed. Additional lane and sidewalk closures remain in place along sections of Woodmont, Norfolk and Wisconsin Avenues (view map of closures here), and we anticipate the closures to remain for an extended period of time through project completion. Late last week, a previously unknown water line feeding Woodmont Grill was discovered on the development site property. During excavation, the line was accidentally broken. Plumbing work to reroute and restore the water line will be completed this weekend overnight between Saturday and Sunday. Water service for nearby properties will not be affected, however, lights will be installed and brief noise may occur as the plumbing work is performed overnight. The developers and general contractor hold monthly construction updates for the general public. These updates are generally scheduled for the first Tuesday of each month, however, there will be no January meeting as this occurs on January 1 (New Year’s Day). Therefore, the next update will take place February 5 at 6:00 p.m. 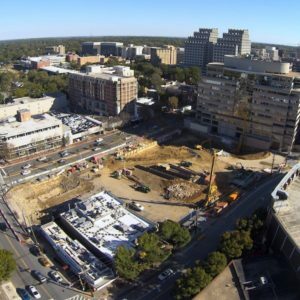 The updates take place in downtown Bethesda at the Montgomery County Regional Service Center, on the second floor in rooms A and B, located at 4805 Edgemoor Lane, Bethesda, MD 20814.